How much thinner can ultraportables get? How much more can ASUS shave off of the ZenBook, its flagship ultraportable? Apparently, quite a bit. The company's new ZenBook 3, announced today at Computex, clocks in at just two pounds and 11.9mm (0.46 inches) thick. In comparison, the previous ZenBook UX305 weighed 2.64 pounds and measured 12.9mm thick (0.51 inches). Sure, those might just seem like incremental improvements, but they're remarkable when you consider just how insanely thin and light the previous model was. 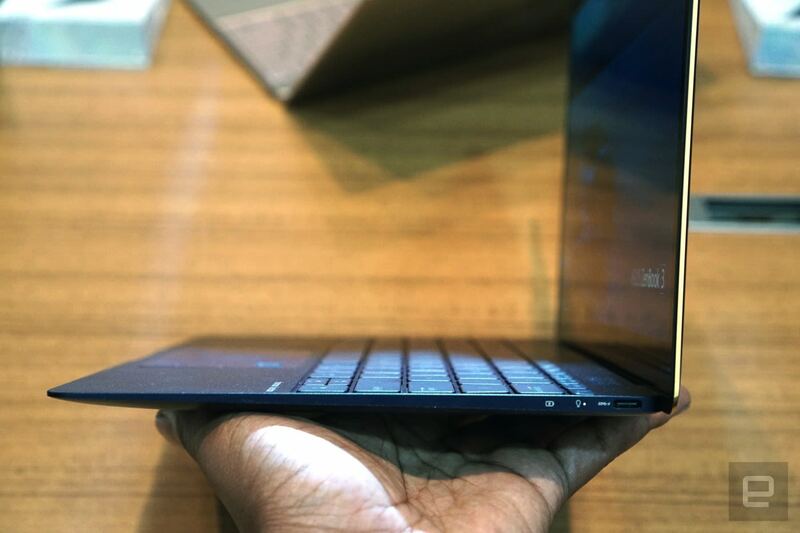 Most impressively, the ZenBook 3 just barely edges out Apple's svelte MacBook, which weighs 2.03lbs and is 13.2mm (0.52 inches) thick, all while packing in a larger 12.5-inch display. ASUS attributes the ZenBook 3's weight loss to a new "aerospace-grade aluminum alloy," which it says is 40 percent stronger than what's typically used in laptops. Honestly, that just sounds like marketing fluff, but there must be something special about the laptop's new material if it lost 0.6 pounds from the last-gen model. ASUS is still sticking with its "spun metal" style, so hopefully you're a fan of the concentric metallic rings on its cases. It'll be available in Quartz Grey, Royal Blue and the seemingly ubiquitous Rose Gold. Unlike the MacBook, the ZenBook 3 won't be under-powered. At the top end, you'll be able to configure it with an Intel Core i7 processor, 16GB of RAM and a 1TB PCIe SSD (which should be faster than a typical SATA drive). The display is covered in Gorilla Glass 4, and it looks like ASUS was also able to slim down the bezel (now the screen covers 82 percent of the laptop's front). 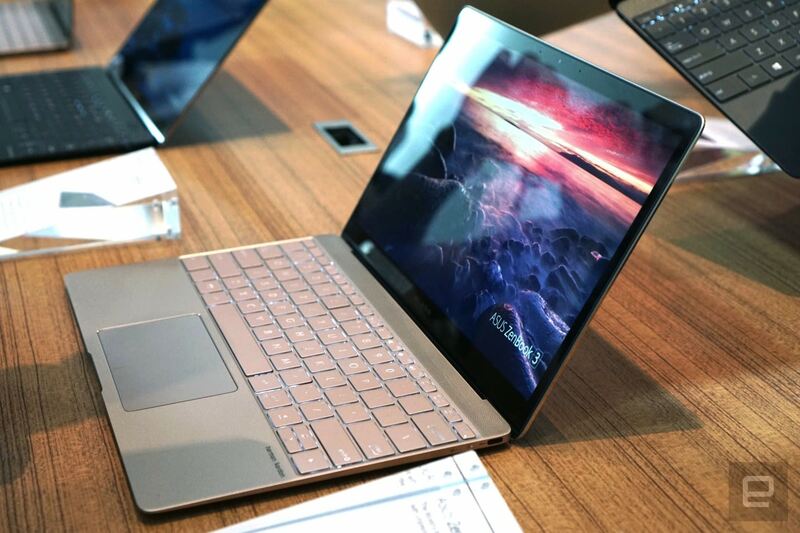 The ZenBook 3 packs in a Thunderbolt 3/USB-C port for charging (which it says can juice the laptop's battery up to 60 percent in 49 minutes), and it should deliver around nine hours of typical battery life. As for cooling, ASUS says it's developed the "world's thinnest" fan at just 3mm. There's also a built-in fingerprint sensor with Windows Hello support. In my brief hands-on time with the ZenBook 3, after wrestling through the crowds at Computex, I can confirm that it's seriously thin and light. ASUS' numbers don't lie: It definitely feels on-par with Apple's MacBook. I didn't feel much of a difference with the new metal case, compared to older ZenBooks, but it still felt sturdy, with little flex when I tried to bend the laptop. After handling it, I'm even more impressed that ASUS managed to cram a Core i7 processor into such a thin case. Unfortunately, the ZenBook 3's keyboard feels incredibly shallow, to the point where I couldn't imagine using it to type much. That's particularly strange, since ASUS made a big deal about having even more key travel space than the MacBook. From what I can remember, though, the MacBook's keyboard simply felt better. The ZenBook 3 will start at $999 with a Core i5 processor, 4GB of RAM and 256GB SSD. Stepping up, you can get it with a 512GB SSD for $1,499, and you can add a Core i7 processor, 1TB SSD and 16GB of RAM for $1,999. ASUS isn't talking about availability details just yet, though.